This custom branded cotton visor will look good on everyone. Ideally suited to keep the sun and hair out of your eyes, visors are a terrific choice for golf or tennis players. With a fabric strap that’s adjustable in the rear, it can be adjusted to fit most head sizes. It has a fresh look and enduring shape. Suits men and women, boys and girls. Made from cotton, the visor has a terry towel backing to absorb moisture when worn. Available in Navy colour. Your club or company logo will be branded on the front, improving team spirit and proudly displaying the logo of your company or team. When you order this cotton twill visor you will receive it with 8000 embroidery stitch counts. For extra customisation consider branding on the strap. 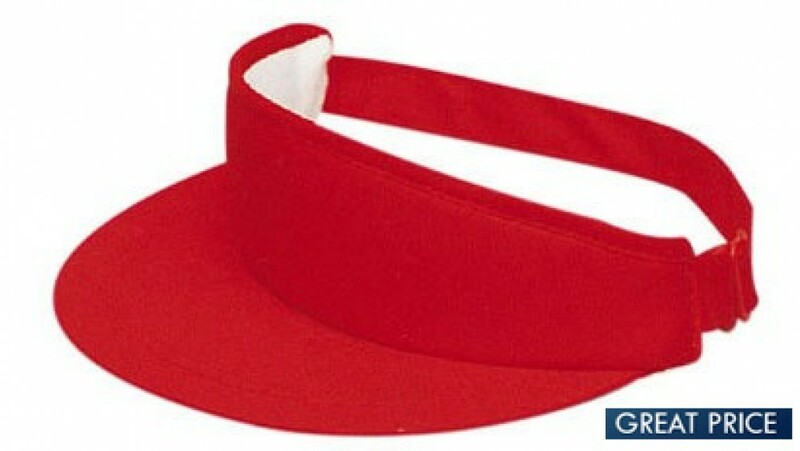 Perfect for outdoor use, this visor is a popular choice for sports clubs and community clubs. To receive a free artwork mock-up, email us your logo in eps or pdf. We can also accept high-resolution jpeg for embroidery. The price excludes GST and embroidery set up applies for orders below 50units. Order this promotional visor today in bulk, branded or unbranded for fast delivery. Our expert decorators will turn this cap into your company's very own. Allow 1 week production time plus delivery. We deliver to your door, wherever it is in Australia. All states and territories -- NSW, TAS, QLD, SA, WA, VIC, NT, ACT. We deliver to cities towns and regional areas. We are not currently able to deliver outside of Australia. A signature is required, so we are not able to deliver to PO boxes. If you are making multiple orders, please let us know so you can bundle freight costs and save. We advise a 1-week turnaround, but rush orders and very large bulk orders can affect delivery speed and pricing. Our friendly sales staff will give you an estimate.